Be sure to finish a Newbery Award or Honor book of 100 pages or more by April 23rd. That is when the next book report will be assigned. The Grammar Expert Group Test on content from Grammar Notes/Presentations Groups 1-8 will be Thursday, 4/18/19. We are currently participating in classroom Grammar Expert Group Presentations and Assignments. The Grammar Expert Group Test will be given shortly after the last Group's Presentation. HRC March is due Thursday 3/28/19. Freedom Walkers Vocabulary and Comprehension Test is Tuesday, 3/5. FW#2 Freedom Walkers People Log due tomorrow. HRC February is due Thursday, February 28th, 2019. All late or absent work must be submitted by Thursday, 2/28 in order to be included on your Trimester 2 grade. Extra Credit: You will receive 2 extra credit points if you complete FW#10 Lift Every Voice and Sing "Writing Prompt" paragraph and include the requirements. Please see the bottom of the attached handout for the directions. Biography Project is due on Friday, February 8th. Home Reading Calendar January is due February 1st. Please begin reading a biography or autobiography of 100 pages or more for the Trimester 2 Book Project (to be assigned January 22nd). Your novel should be finished at that time. In most libraries there is the possibility that some books may contain mature content that is not appropriate for a 6th grade reader. Please discuss your child's selection with him or her in order to ensure that it does not contain any material that you do not find suitable. We have visited our school library to allow students to select a novel to read; however, biographies may be attained from any library or store. Thank you so much for the kind support. My Life Timeline and Paragraphs is due 12/19/18. HRC November is due on Friday, 11/30. The last day to turn in any late/missing/or absent work for Trimester 1 is Thursday, 11/15. 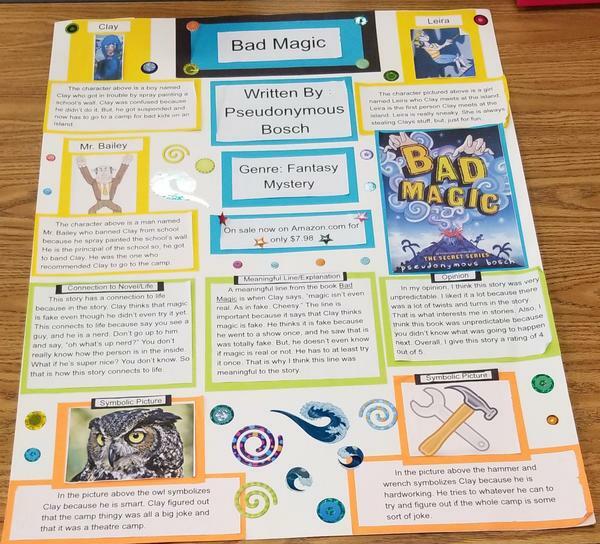 Here are the directions and a picture of a sample visual aid poster for the Trimester 1 "Book Talk" book report. The project will be due the week of November 5th. Each student will present on his or her assigned presentation date. HRC October due Thursday, November 1st. Please be sure to read a fictional novel of 100 pages or more by October 19th. That is the day that I will be assigning the Trimester 1 book report. Extra Credit: Submit an entry for the Library Bookmark Contest to Mrs. Dawa by October 11th. Submit online the Think Q's for the story "Eleven" (Page 50) Q's 1-3 using the ACE Method. Home Reading Calendar September is due Friday, September 28th. Please see the calendar for specific directions. Symbolic Mind Paragraph due typed on Wednesday (please see handout for requirements). Symbolic Mind Pt. 1: Symbolic Head due tomorrow (after 20 mins. of extra work time). Attached are the directions and an extra copy of the Symbolic Head.